Human beings might not even remember that dressing once had only a functional meaning in their lives – to protect the body from wheather conditions. After this first moment and over the centuries, dressing incorporated other meanings – social, religious, or even ideological and political – to become, as it is today, an act of codes, rituals and cares. The history of eating has followed a similar path – if the purpose of food once was just to ensure survival for human beings, it has gained developments over time and, permeated by economic, social, religious or geographic issues, food has also acquired its codes, rituals and cares. When we look at the evolution of manners and customs, we can also observe another aspect, more subtle but not less relevant: the need for humans to give greater pleasure to mandatory acts which are essential to their existence. As man became conscious of his own existence and gained perception of his tastes and pleasures, he was no longer able to stand endless, mechanical and routine repetition of tasks that did not provide comfort also to his soul. Expanding the meaning of such affairs has become imperative. We can confer beauty and therefore pleasure to any acts and accomplishments of the human being, and to the various ways of relating to them and among ourselves. In the introduction of his book “A beleza salvará o mundo” (Beauty will save the world) – (Ed. Difel, 2011), the philosopher Tzvetan Todorov explains that beauty, be that of a landscape, a date or a work of art, does not refer to anything beyond these things, but makes us appreciate them as such – and therefore, allows us to try the sensation of living full and exclusively the present moment. 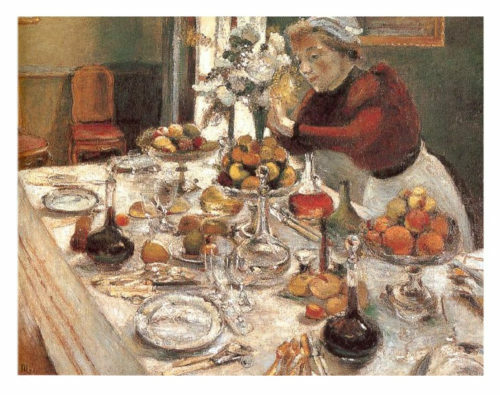 Being at the table to enjoy a meal is one of the richest and most frequent opportunities we have to experience such a feeling – and it amazes me to see how many men and women waste it daily by relating to food as did our ancestors. At the table, the shape of arranged objects, the taste of a certain food, the encounter with the others, or with yourself, are all possibilities for us to enjoy this fullness – in the words of Todorov, “instant yet infinitely desirable feeling which gives meaning to our existence; thanks to these precious moments, it becomes more beautiful and richer in senses”. Let us, therefore, be attentive and generous with ourselves, remembering every day that every meal is a chance to meet with the beautiful, to give ourselves pleasure and thus to expand the meaning of our existence.